Compare and contrast the response of the American president to protests in Iran, with PDT’s response first. US President Donald Trump has warned Iran that the “world is watching” after two days of protests against the country’s religious rulers. Hundreds of people took to the streets in Mashhad, Iran’s second-largest city and one of the holiest places in Shia Islam, on Thursday. The protests spread to Tehran and other cities on Friday, with police using water cannons in some cases to disperse the crowds. Initially aimed against high prices, the anti-government protests quickly turned against the Islamic regime as a whole. Police arrested 52 people. On Saturday, tens of thousands of government supporters marched in cities across Iran in a show of strength for the regime. Many of the marchers carried banners in support of Supreme Leader Ayatollah Ali Khamenei. Mr Trump tweeted in support of the anti-government protests. “Many reports of peaceful protests by Iranian citizens fed up with regime’s corruption and its squandering of the nation’s wealth to fund terrorism abroad,” he wrote. 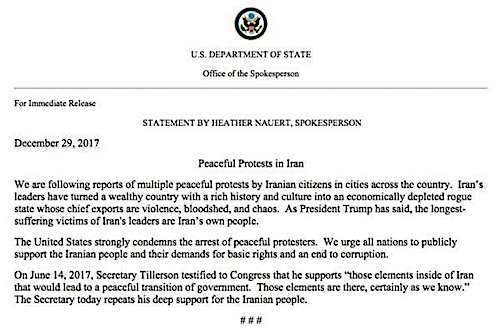 And the US State Department condemned the arrest of peaceful protesters and urged “all nations to publicly support the Iranian people and their demands for basic rights and an end to corruption”. Mr Trump has refused to re-certify a 2015 deal between Tehran and world powers that curbed Iran’s disputed nuclear programme in return for a lifting of most international sanctions. The deal was one of the biggest achievements by President Hassan Rouhani, but has yet to bring the broad economic benefits. State television said pro-government rallies were scheduled to be held in more than 1,200 cities and towns on Saturday. This was Obama’s: Obama Stands Firm on Restrained Response to Iran Protests. Obama said nothing about the crisis in public on Sunday, although a spokesman said he discussed Iran with foreign policy advisers in the Oval Office for more than 30 minutes. He later went golfing in Virginia. On Monday, the president had two public events, but was not expected to comment on Iran during at least one of them. Restrained as in do absolutely nothing in any way to assist those who are trying to free themselves from an Islamist theocracy. Referring to the “billions in sanctions relief the Islamic republic secured through the nuclear deal”, Arkansas Republican senator Tom Cotton wrote on his Twitter account, the ayatollahs still can’t provide for the basic needs of their own people-perhaps because they’ve funneled so much of that money into their campaign of regional aggression in Syria, Lebanon, Iraq, and Yemen”. We remember 2009, when Barack Obama, hell-bent on a fanciful alliance with the mullahs, shamefully betrayed the Iranians who rose up, expecting to be supported by us. The Trump administration’s response is of course a welcome contrast. But one wonders: why are Iranians rebelling now? Certainly they have economic grievances, but are these really new? What has happened, recently, to explain the current uprising? I wonder whether the Iranian rebellion has been incited, at least in part, by a conviction that there finally is an administration in Washington prepared to support them, at least morally and perhaps materially. Why would Iranians think that? No doubt they have paid close attention to President Trump’s willingness to stand up to their oppressors. And perhaps Trump’s recognition of Jerusalem as Israel’s capital sent a signal that there has been a changing of the guard in Washington. This is pure speculation, but maybe the fact that we now have a president who is pro-United States and pro-freedom, instead of anti-United States and pro-mullahs/Muslim Brotherhood, etc., has inspired Iranians to march for liberation. It will be interesting to see how events play out in the days to come.